Over 30 resident yarnbombers gave a tree at Churches of Christ Care's Regency Park Retirement Village a woolly makeover as part of Warwick's annual Jumpers and Jazz in July arts festival. 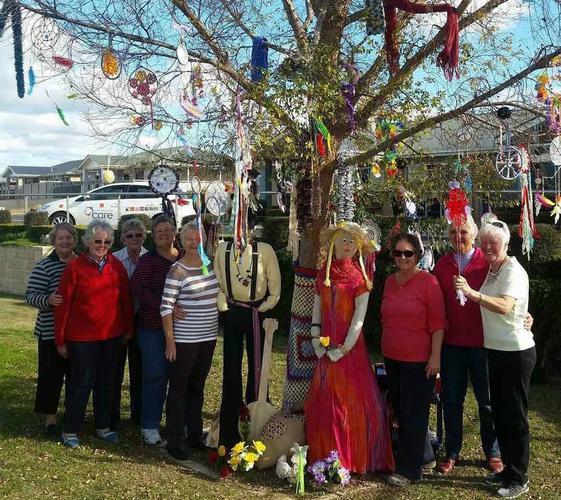 The Queensland festival sees the CBD and many other areas transformed into an outdoor art gallery as trees, buildings and statues are creatively decorated with textile artwork. Anyone can participate in the event, resulting in flamboyant, colourful, heart-warming and often comical entries. At the same time, there is a program of jazz concerts at numerous venues throughout the area. The event’s theme this year was ‘Bohemian’, and Regency Park residents added their own twist to their creation by incorporating some traditional Native American inspired craftwork and a couple of life-size models too. Planning for the tree decorations started around a month before the event. As well as making the ornate dream catchers and the colourful trunk wrap, residents creatively used donated scarves, blankets and other winter woollies to decorate the tree. Regency Park Retirement Village is expanding and Churches of Christ Care will be unveiling its limited eight unit release there at a Queensland Seniors Week open day on Wednesday 17 August.